I really can’t call this a recipe because it is so simple but I wanted to share it anyway. 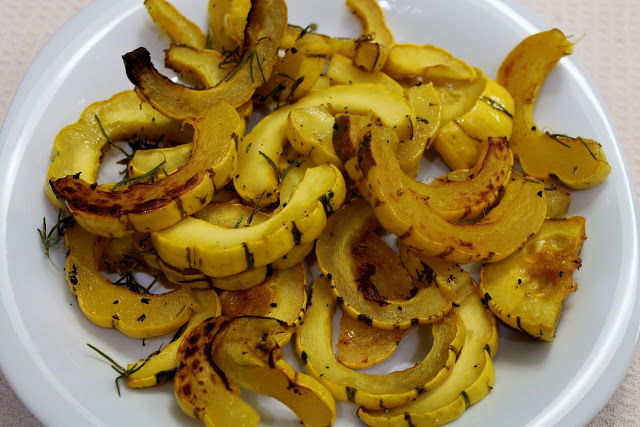 This was my first experience cooking and for that matter eating delicata squash. Like butternut squash, the delicata is another one of those winter squashes. In my attempt to embrace some of these funny looking vegetables I picked up the delicata to give it a try. It has a mildly sweet taste and because of the thin skin there is no peeling required. As you know, that is not the case when cooking with butternut squash and one of the reasons many of us don’t like to work with it. If you are one of those people then let me introduce you to your new best friend. All you have to do is cut the Delicata in half, remove the seeds and begin slicing into half moon shapes. Drizzle with olive oil, fresh rosemary, salt, pepper and roast in the oven on 375 degrees for 35 minutes. It is that simple making it a perfect healthy side dish for an easy weeknight dinner.